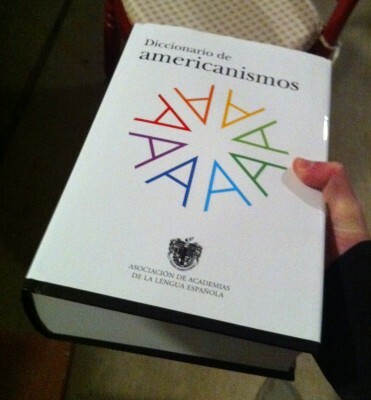 I was recently reading a copy of the “Diccionario de americanismos“. This is a real big old fashioned macho dictionary made out of paper. It recalls memories of how people looked word definitions up before we were spoiled by Google, Infoseek, and Sharp Pocket Dictionaries. 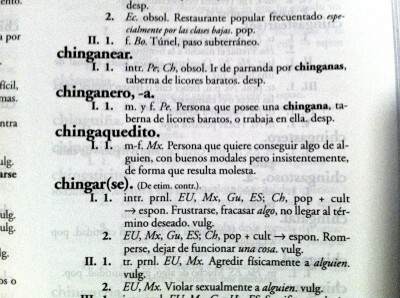 But this dictionary is special – and useful for those of you who are learning Spanish using Rosetta Stone, yet don’t understand a single word that us hip latinos use amongst ourselves. It is published by the Royal Spanish Academy and contains all the slang from Latin American countries. That’s why it’s so big and heavy. It survived multiple attempts from myself (Mexico) and friends from Chile and Venezuela to find a missing slang definition. I even found the definition for one of my childhood nicknames! chingaquedito. m-f. Mx. Persona que quiere conseguir algo de alguien, con buenos modales pero insistentemente, de forma que resulta molesta. Reinventing the wheel... one spoke at a time.